Rebecka Stillman, Katie Vickers, Inga Huld Hákonardóttir "We Will Have Had Darker Futures"
We Will Have Had Darker Futures attempts to weave together past, present and future and to mix it all up into a time loop allowing our sense of temporality to be blurred. 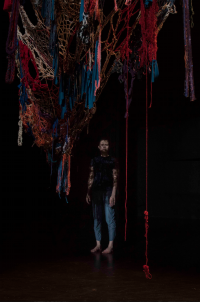 We Will Have Had Darker Futures thinks of possible futures through daydreaming, language, and dance while emphasizing the passage of time in the act of collective finger knitting. We Will Have Had Darker Futures is a short term detachment, a visionary parallel reality that contemplates the bounds between past and present.